Mary Colter is considered one of the most important contributors to the style of structures in Grand Canyon National Park. 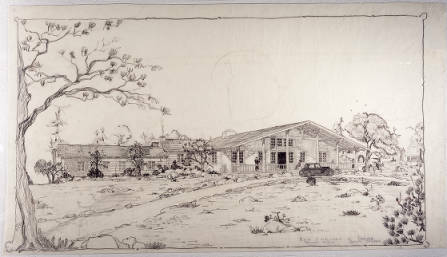 She designed or decorated 6 buildings on the rim in total, including assisting with interiors at the El Tovar. She was a prominent employee of the Fred Harvey Company and is known for her association with unintrusive architecture that blends with the natural landscape. Today, the US Register of Historic Places has grouped 4 structures together under the protective designation of The Mary Jane Colter Buildings. These buildings are the Hopi House (1905), Lookout Studio (1914), Hermit’s Rest (1914), and the Desert View Watchtower (1932). They are all considered National Historic Landmarks today. 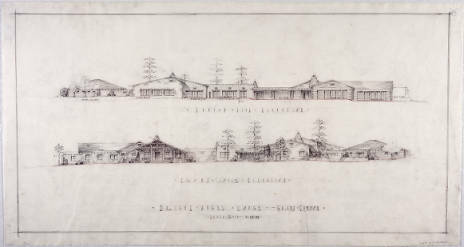 Architectural Drawings of the Bright Angel Lodge and the Grand Canyon Village, 1933-1935.